Anahid Aslanyan is an Armenian/American artist born in Iran. San Francisco is her home, and she has made art since childhood. She lived and exhibited at the historic Goodman Building, an artists’ community in San Francisco in the early eighties. She obtained her BFA from the San Franciso Art Institute in 1988. Her work has been shown and published since 1978. 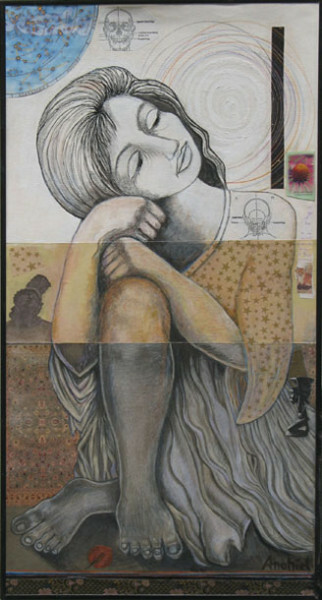 She has also exhibited internationally in Armenia and the Czech Republic. She works with acrylics, aqua oils, mixed-media, collage and assemblage. Nature, she says, is the strongest inspiration for her art. “My passion is painting, translating emotional truths into color and form. I follow my vision wherever it takes me without regard for trends or fasion. The painting is a vehicle of expression, a magical process, the artist being a vessel or channel for her muses. I rarely impose my ideas on a painting; instead I let the painting tell me what it needs. This intuitive process is exciting and unpredictable. I sometimes use drawings, photographs, collage and found objects, but all in the service of the vision that is presenting itself at the moment and changing as it completes itself. To view more of her work, please visit the artist’s website: anahida-creations.weebly.com.